The Days of Johann, an agility dog! : We went lure coursing! Gracie and I got to go lure coursing yesterday! We got up, did a few things around the cabin, then headed out to a place near Canton, Georgia where we went sheep herding last weekend. The last time we were there the lure coursing wasn't working, so we couldn't try it out, but the nice folks there gave us a free pass to come back another Saturday to give it a go. We thought that was super nice! When we got there, it wasn't working again...but they said it would only be an hour or so wait till it was. So we hung out for a while, met some folks and dogs, and then took some time and went on a short little hike around the property. That was fun! 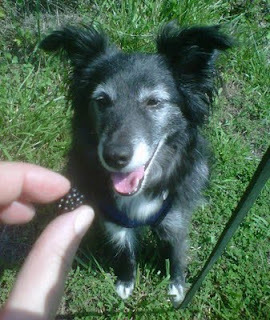 We found some Blackberries just starting to ripen all along the fence line of the property, so Mum took just one, and then gave me just one...Gracie was too interested in all the rustling in the field next to us to be interested, BOL! Nom....gimme! Pretty soon it was time to start. The lure that they used was just a piece of flappy plastic. Now I'm a smart dog and so is Gracie...so that little piece of yellow plastic wasn't much of an incentive or held much interest for either one of us. Although a couple of spaniels that were there found it pretty fun, but a tad confusing. So we weren't chasing it at all, much more interested in the potential of sheep over in the ring up the hill. Then one of the nice ladies that was there went and got a skinneez from her car and they tied it as the lure. OK, now we're talking!!! Fake squirrel...that is a whole lot more fun than a piece of plastic! So Mum got me going and I did really well (no video of me since she was too busy watching me have fun :). And then Mum got a little smart and took out that new little camera we have and finally got some video of Gracie chasing the lure (she liked the fake squirrel too :)! Sorry the camera doesn't have a very good zoom, but you'll get the idea. Here's Gracie's vid, at one point she caught the lure, silly girl!!! But then got right back in the action. We think she deserves a nice diamond bracelet for catching that little faker, BOL!!! It was a super fun day! It was really starting to get hot, hot, hot by the time we left. So we got home up the mountain where it was almost 10 degrees cooler. Ahhhhhhh......!!!!!! After a nice rest, we are raring to go again this morning! Hope you are having a pawsome Holiday weekend!!! Happy Birthday America!!! !